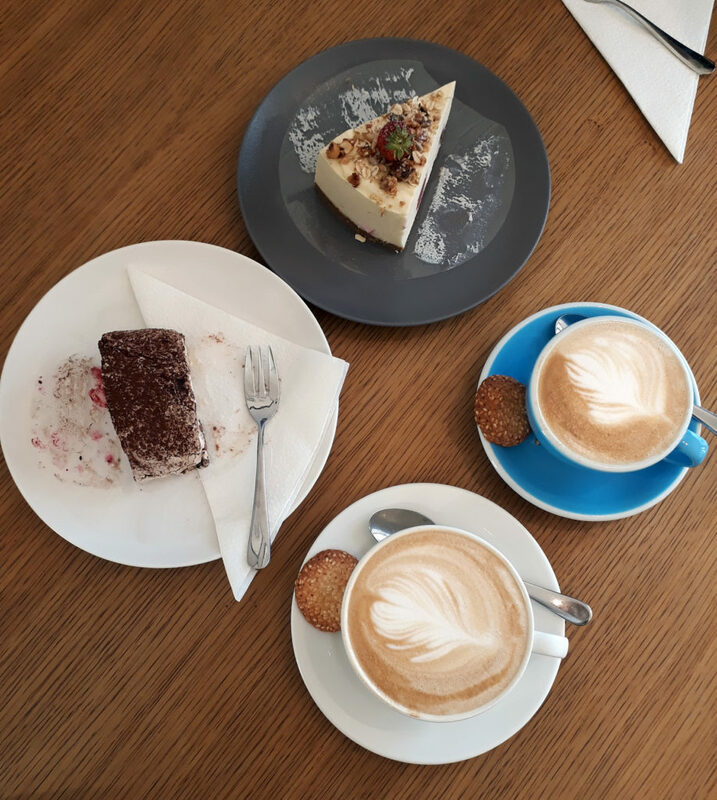 Welcome back to my project of slowly reviewing all the coffee and cakes in Tallinn with my friend Greta, this week: actually eating cake again! (also sorry for the long absence but it’s been too hot for cake). Review: The heat has just been absolutely killer for the past two weeks so it’s hard to feel like eating cake (or anything honestly) in that kind of weather. But you’re here for a cafe review, so a cafe review you will get. 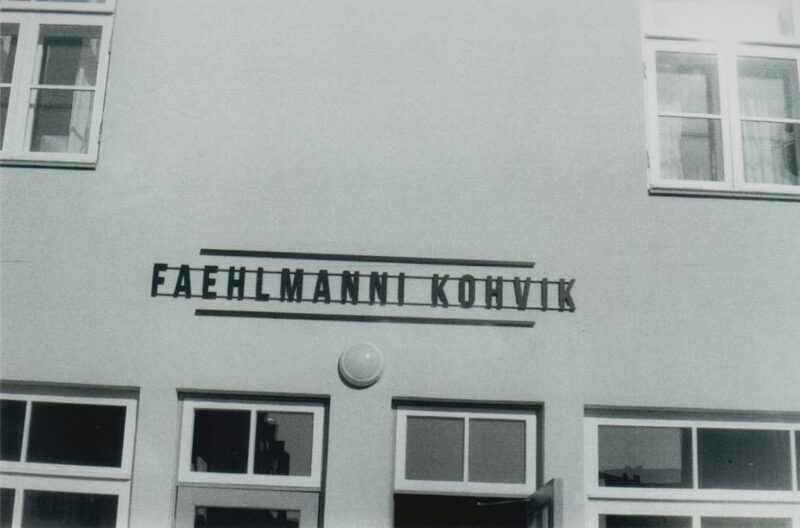 Feahlmanni kohvik is located just a few blocks from the Police Garden Park. Right now the streets around it are being worked on but generally you can reach the cafe easily walking down from the Tallinna Ülikool stop off the number 1 or 3 tram, OR with any bus that goes past the park. Since it’s just slightly off the tourist path, it’s rarely ever completely full. There is a large floor plan inside with an ample variety of seating from larger tables to a counter top style bar. Since it’s the summer they also have a porch out front with extra seating. I was pleasantly surprised to see the cafe more than half full at a leisurely hour on a Thursday. 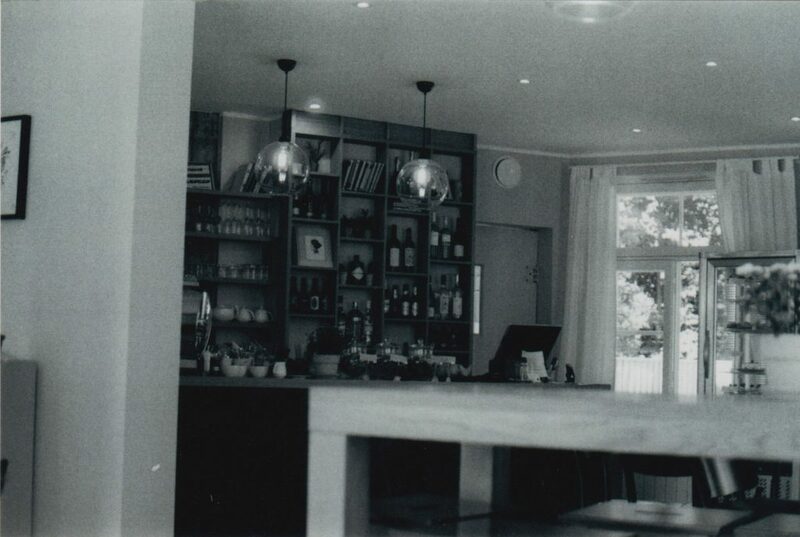 The seating is comfortable and the staff will serve you at the counter or at your table. They had about a half dozen selections of cakes but they also have a limited menu of regular foods and almost everyone outside was enjoy either a bottle of wine or a colorful cocktail. They have your standard coffee menu and a daily lunch offering as well so it’s really a great cafe no matter what time of day you’re stopping in at. I got the Black Currant Roll Cake and I was absolutely not disappointed. Black currants, if you’ve never had them have a taste that is a mix of earthy, sour, and acidic. Ripe ones have just a hint of underlying sweetness which made this cake really refreshing. 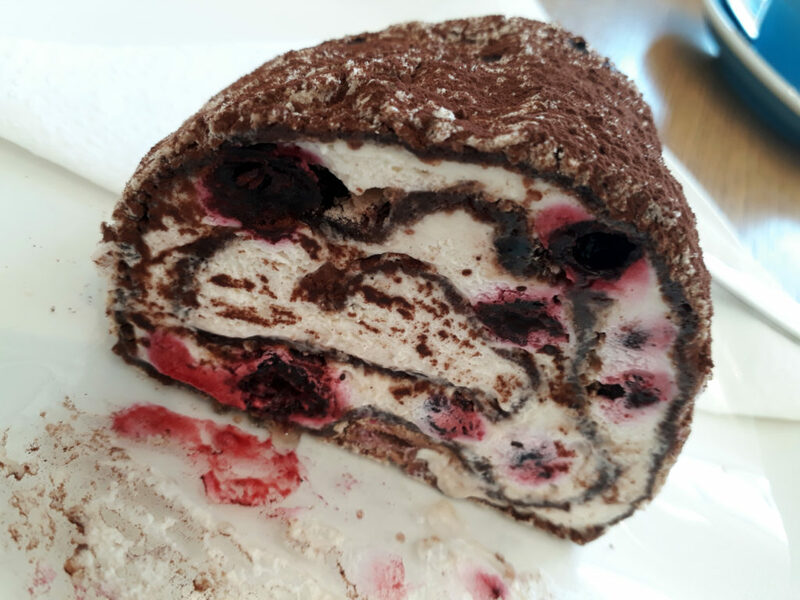 Abstractly this is a roll cake but as you can tell from the picture the cake portion is quite thin which ended up meaning this piece was about 70% cream and 15% currants and 15% chocolate biscuit-style cake. The piece was actually just the right size leaving me sated but not overfull and the mix of sweet cream and acidic berries gave me the feeling that I was eating a berry version of coconut cream pie. The only disappointment was that I didn’t really taste the chocolate cake at all. As much as I love an excuse to eat a pile of cream (and you know I do), I probably would have enjoyed a slightly thicker cake layer – maybe a 60:25:15 ratio of cream:cake:berries. All in all, a fairly good pile of cream if that’s what you like. Greta got the Cheesecake with Strawberries. I actually really love the look on this cheesecake because cheesecake can often be a pretty plain experience. 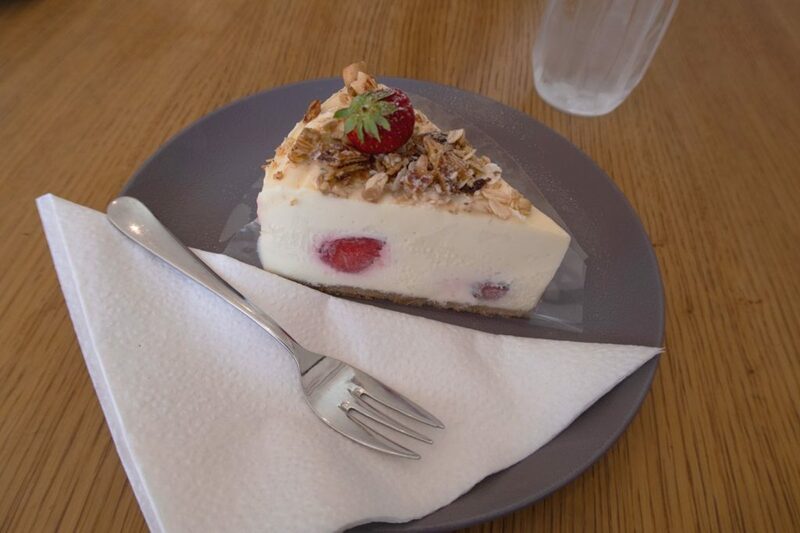 This cheesecake not only had a strawberry on top but also granola for an extra crunch and more berries hidden inside of it. While it probably wasn’t the best cheesecake on Earth, it’s a solid pick especially on a warm day when you’d like something cool and creamy. Plus Greta said that it wasn’t too sweet either which is a big plus. The coffee was really good here. I’m not sure if it was just that I really needed a coffee that day or what but I drank my latte in record time and it felt like it was soothing my soul directly. Greta actually ordered a second coffee drink so maybe the coffee was actually that good. In addition, the service was absolutely impeccable. The waitress at the counter bantered with us, came to the table to ask if we needed something else, and was just all around wonderful. It was the type of above and beyond service you don’t expect when you only order a few euros of food (I ended up tipping because I liked the service so much). Overall this was a great cafe. I’ve been here previously for the food and I’m glad I came back for the cake. It’s absolutely a place I’d recommend to anyone traveling through looking for a laid back experience with good food and drinks. I’ll definitely be visiting Faehlmanni again in the future. For anyone who is curious while we were there many people came through with their dogs, it seems like a really popular spot for dog owners.